OhMyVera! 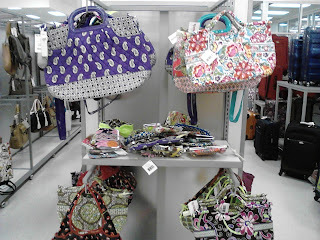 A blog about all things Vera Bradley: More Vera Bradley at TJ Maxx! Here are a couple more pictures of Vera Bradley bags at TJ Maxx. I can't believe how much some of the stores have! I wish the ones in San Diego had that much while I was there. The one store I checked near DC didnt have any. 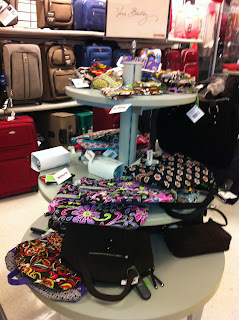 Thanks Liz & Karen for sending in these photos! Anyone know (or have guesses) as to what patterns are going to retire next? Would there be colors retiring in the spring? hey is the green blue and brown peacock pattern retired? Not sure which colors will be retired next. Should be a couple of months until any else gets retired. Peacock was retired in December of 2008...but they have made some of the new styles in that color, they must have had an overstock of fabric. Any idea where I could find a list of all VB styles, retired and current? I've gotten obsessive about collecting a couple of the purse styles, but I can't even find the name of what I'm collecting! VB customer service said even they have to ask corporate because they don't even have a list! Any help would be greatly appreciated!